Gentle exfoliating cream deflakes and helps minimize the appearance of fine lines. Helps to remove dead skin cells leaving your skin silky soft. Clears the way for moisture. Use twice a week for best results. 4fl oz. Directions: Wet your face and gently massage it with the facial scrub in a circular motion. Do not use on eyes. Rinse with cool water. Pat dry with soft cloth. 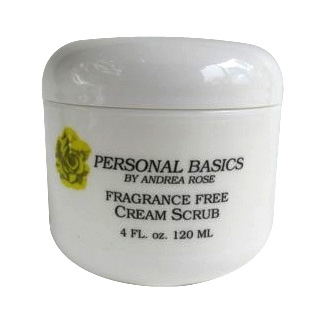 Follow with Personal Basics Moisture Cream and Eye Cream. Ingreients: De-onized Water, Caprylic/Capric Triglyceride, Butylene Glycol, Polyethylene, Ethylhexyl Hydroxystearate, Isocetyl Stearate, Pentaerythrity Tetraethylhexanoate, Ceteareth-20,Cetearyl Alcohol(and) Ceteareth-20, Sorbital Glyceryl Stearate (and)PEG-100 stearate, Cetyl Alcohol, Stearyl Alcohol, Ethylhexylglycerin, Caprylyl Glycol (and) Phenoxyethanol (and) Hexylene Glycol, Carbomer, Tetrasodium EDTA, Triethanolamine. Your scrub is out of this world! I'm so glad you have it! Just one more great product! Thank you! Great product! It doesn't irritate my skin and it works beautifully! I'm very pleased with this product. I tried another sal free scrub this one is far superior. It leave my skin so soft and smooth. Thank you Andrea Rose for such wonderful products! Excellent product! Leaves my skin so soft and smooth!